Generally, structograms are meant to be free of a specific syntax, but if you want to benefit from the advanced features of Structorizer (e.g. test execution, code export, code import etc. ), you must allow Structorizer to classify or identify certain details of the algorithmic structures. 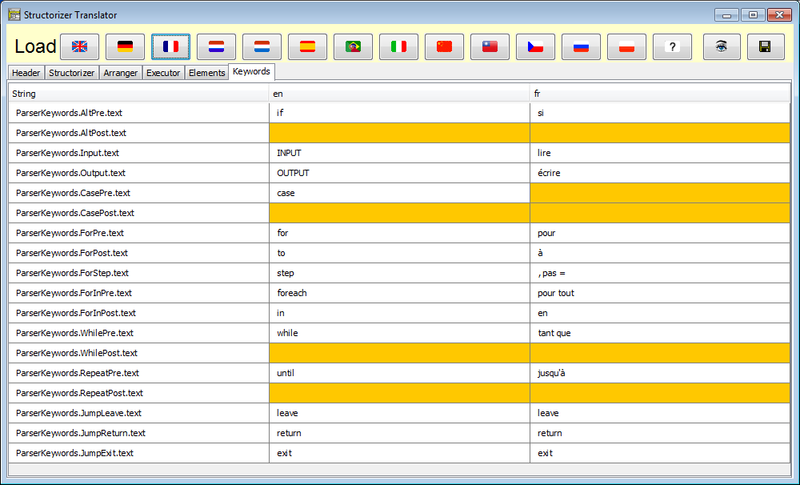 Therefore it needs certain keywords in the element texts. For instance, the correct detection and semantical distinction of FOR loops depends on such keywords. This also holds for the identification of input and output instructions and EXIT elements. But you are free to specify (customize) these keywords according to your own preferences and needs. This is what the Parser Preferences are for. For most control structures, you can define a leading "Pre" and trailing "Post" keyword, where "Pre" and "Post" refers to the characteristical text content you are to enter in the element editor on inserting an element of that kind (e.g. the condition of an alternative or loop). So Structorizer will know what prefix and postfix can be ignored in order to extract the actual logical expression. Some control structures like FOR loops and EXIT statements, however, require more keywords to separate several expressions in the element text or to classify the denoted action of the element. 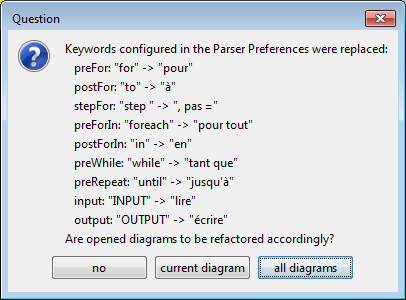 Depending on what module uses the diagram parser (see below), these keywords are being filtered out, replaced, or used to split the text. The checkbox "Ignore case" controls whether the parser keywords configured here are to be matched in a case-sensitive or case-ignorant (or say tolerant) way, the latter being the default, e.g. it wouldn't make a difference whether you write "INPUT", "input", or "Input" (or even "iNpUt") in your diagrams; Structorizer would recognise it while option "Ignore case" is active. Be aware, however, that this case tolerance only applies to the keywords configured here, not to variable names. If you do not intend to use any of them or if you are fine with the pre-configured set of keywords, then you may abstain from adjusting the parser preferences. In most cases, however, you may want input and output instructions detected, FOR loops properly interpreted etc. In this case you will either have to stick to the configured parser preferences on writing diagrams or to adapt the parser preferences to the keywords used in the diagram. The translation of the diagrams induced by pressing the "OK" button is individually undoable for every affected diagram. Obviously, for loading diagrams that have been created in a context with differing keywords, a similar problem might occur. And so it would when you load some archived preferences. But Structorizer is prepared: See Import options and loading preferences for the related aspects of diagram refactoring. Though Parser settings are technically independent of the "structures" preferences, it makes sense, of course, to configure e.g. 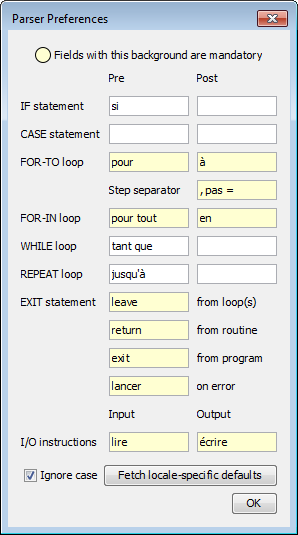 the "Pre" condition keyword of a Repeat loop as "until" if you happened to specify the default text for the Repeat loop as e.g. "until EXIT_CONDITION" or "until ?" in the "structures" preferences. With FOR and FOR-In loops, in contrast, the default phrase in the "structures" preferences is split by the element editor based on the "Pre" and "Post" keywords configured here in order to decide the style and the parameters of the loop. Therefore you will typically be offered automatically to adapt the structure preferences consistently when you changed the Parser Preferences (but not the other way round). 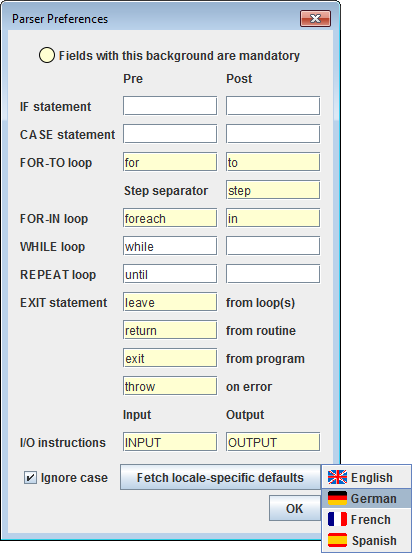 The "Pre" keyword of the FOR-In loop is not required to differ from that of the FOR loop. In versions before 3.29-04 it was even allowed to be empty - in this case Structorizer assumed that the "Pre" keyword of the FOR loop served also as "Pre" keyword for the FOR-IN loop (though this behaviour was flawed in some aspects, so it won't be supported any longer). The "Post" keyword of the FOR-IN loop must not be equal to any other keyword of the parser preferences (this is to ensure that Structorizer is able to tell a FOR-IN loop from a FOR loop, in case both "Pre" keywords are equal). The keywords for the EXIT statement and for input and output instructions must mutually differ. None of the keywords must contain a colon (':').